The sketches below were mainly based on where I was over the last couples of weeks, I was on the coast of Cornwall. The tank? 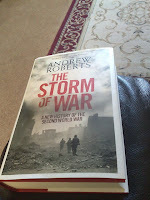 Well, theres not many tanks in Cornwall I must say, but I have also been reading the book : Andrew Roberts - "Storm of War" which ingrained the image of tanks in my head.